On Wednesday 3rd October, I will join forces with locally celebrated chefs, Nick Male from British restaurant The Loft, Phil Thompson from the renowned Thompson St Albans and Shwan Baban from modern Turkish restaurant Tabure to create a stunning four course menu. This year, all profits will be donated to Herts Young Homeless, an independent charity supporting vulnerable people on Hertfordshire since 1998. This follows the first ever Lussmanns’ Dream Team Charity Dinner, on 7 February 2017 where we raised £10,483 for local counselling charity Youth Talk based in St Albans. Marking the St Albans Food & Drink Festival (26th September – 8th October) and a nod to British Food Fortnight (22nd September – 7th October), the menu will showcase quality produce with provenance, sustainability and ethically-sourced at its heart, underpinning the Lussmanns values and ethos. Furthermore it will provide a unique evening of top quality cooking bringing together some of the most exciting chefs in Hertfordshire today. Herts Young Homeless is Lussmanns’ 2018 charity, which provides thousands of vulnerable people in Hertfordshire each year with a dedicated Nightstop Herts Service that provides emergency accommodation for young people who would otherwise sleep rough. A full wine & drinks list will be available in addition to the ticket price alongside an end of evening raffle with all proceeds going to Herts Young Homeless. Please note that Laura from Lussmanns will be in touch to ticket recipients one week prior to the event to confirm exact timings and discuss any dietary requirements and allergens. Please note vegan and vegetarian options are also available upon request. 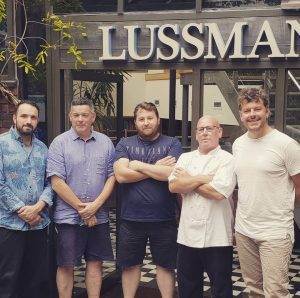 I look forward to welcoming you to Lussmanns in St Albans.